Easy Carrot Cake Cookies are a fun and easy twist on the classic moist, spicy, cream cheese-frosted cake so many people love. Don’t tell your kids they’re carrot cookies; just let them enjoy the sweet tang of the cream cheese frosting. These Easy Carrot Cake Cookies are great for gatherings where you don’t want to carry, cut, and serve a traditional carrot cake. 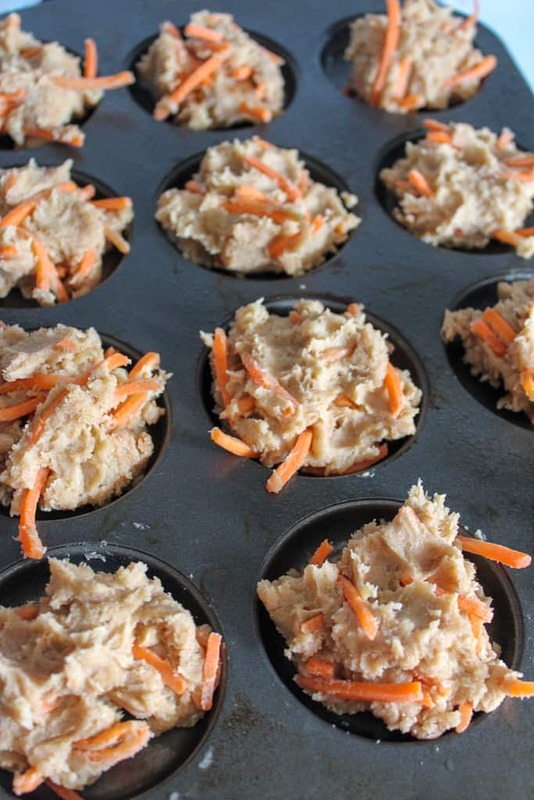 Single-serving desserts like Easy Carrot Cake Cookies make transport and clean-up quick and easy! Use a box grater. A box grater sits very stably on your cutting board or counter top which allows you to get the job done without grating your fingers. Use a food processor. 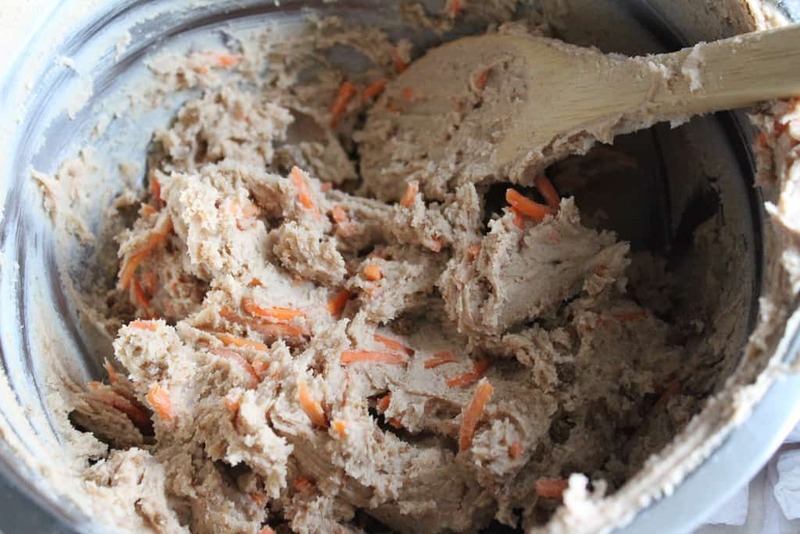 You can process a pile of carrots into lovely shreds in seconds with a food processor that has a grating blade. If you give the processor bowl and blade a quick rinse after you’re done, the clean-up is quick too. Buy already shredded carrots. 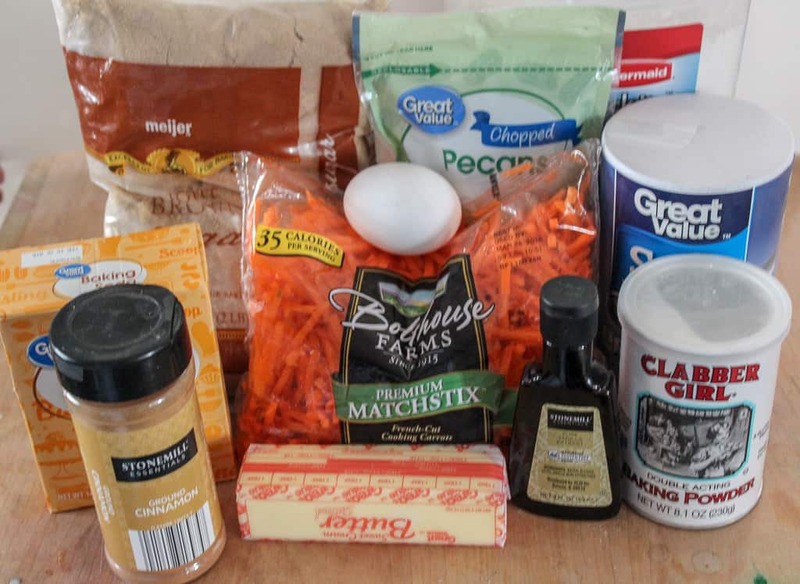 Bring home a bag of pre-shredded carrots and this Easy Carrot Cake Cookies recipe practically makes itself. It’s not hard to add a little pizazz to storebought frosting if you want to do something a little fun. 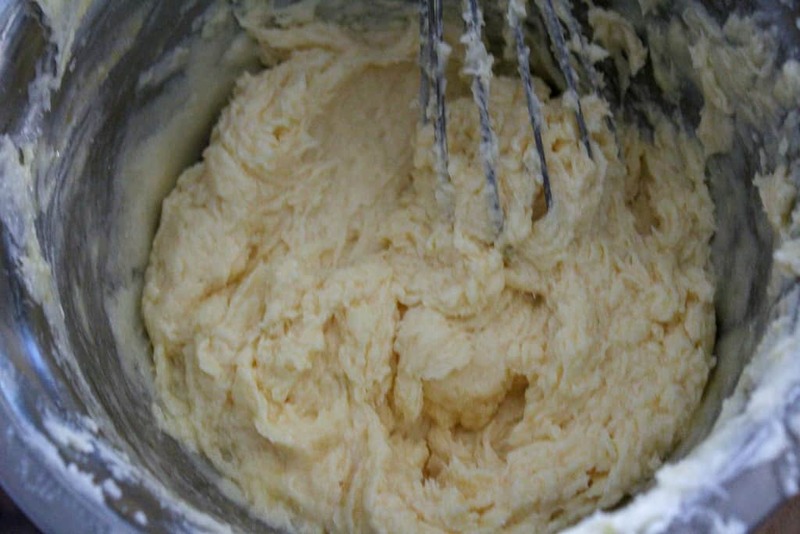 Use a spatula to scrape the store bought frosting into a bowl and experiment with adding small amounts of vanilla extract, lemon zest, or food coloring. Make the recipe your own by adding your own little twist. Step #1: Gather your ingredients before you start so you can throw these together quickly. Step #2: Preheat the oven to 375. Step #3: Spray a whoopie pie pan (which is what we used) or other cookie sheet with non-stick spray. Step #4: In a large bowl, mix the wet ingredients. Cream the butter, sugars and eggs together. Add the vanilla and mix. 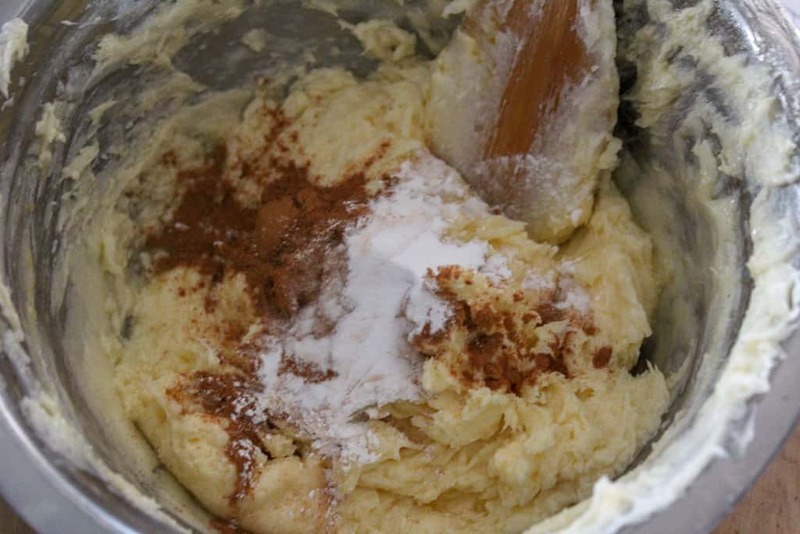 Step #5: Mix in the cinnamon, baking powder, soda, and salt. Add in flour and mix well. Step #6: Fold in shredded carrot. Step #7: Once the batter is thoroughly mixed, drop into greased whoopie pie pan. Step #8: Bake at 375° for 13-15 minutes. Remove from oven, allow to fully cool, and frost with cream cheese frosting. 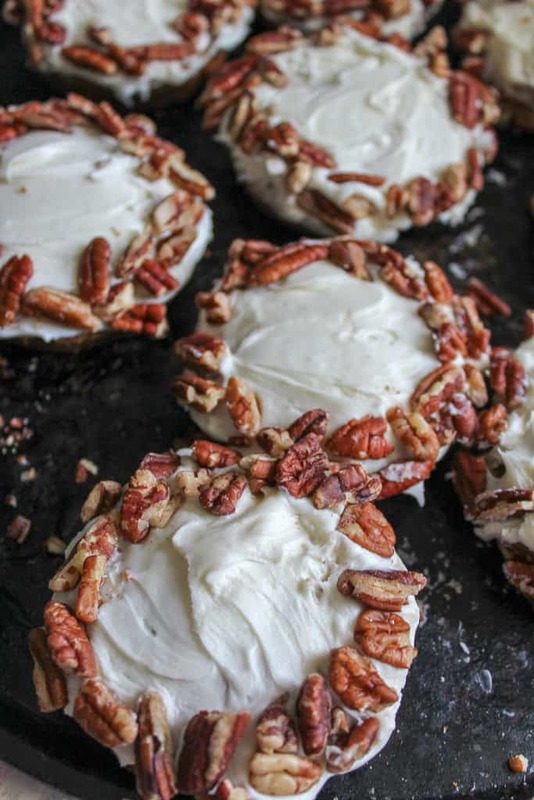 Decorate with chopped pecans around the edges of the cookies. 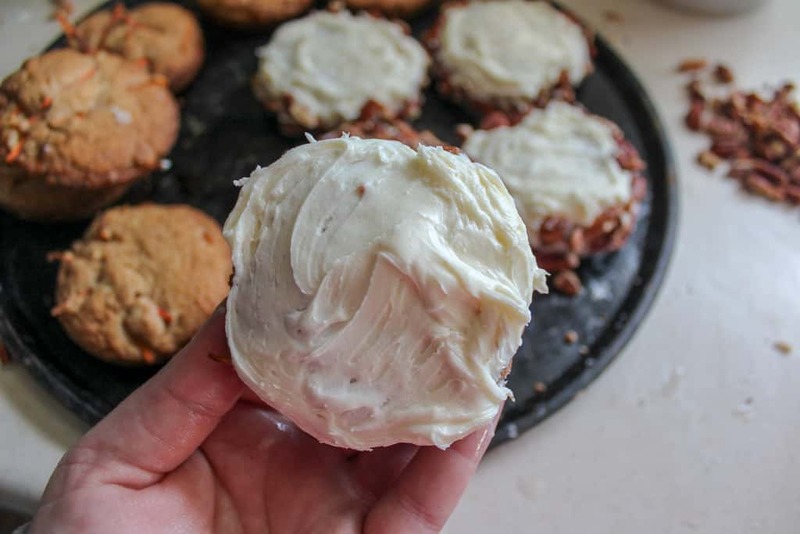 Instead of frosting each cookie individually and adding pecan pieces, try making a carrot cake cookie whoopie pie by adding a thick layer of cream cheese frosting onto a carrot cake cookie and adding another carrot cake cookie on top. Yum! A fun twist on traditional carrot cake. Preheat the oven to 375. Spray a whoopie pie pan (which is what we used) or other cookie sheet with non-stick spray. In a large bowl, mix the wet ingredients. Cream the butter, sugars and eggs together. Add the vanilla and mix. Mix in the cinnamon, baking powder, soda, and salt. Add in flour and mix well. Fold in shredded carrots. Bake 13-15 minutes. Allow to fully cool and frost with cream cheese frosting. 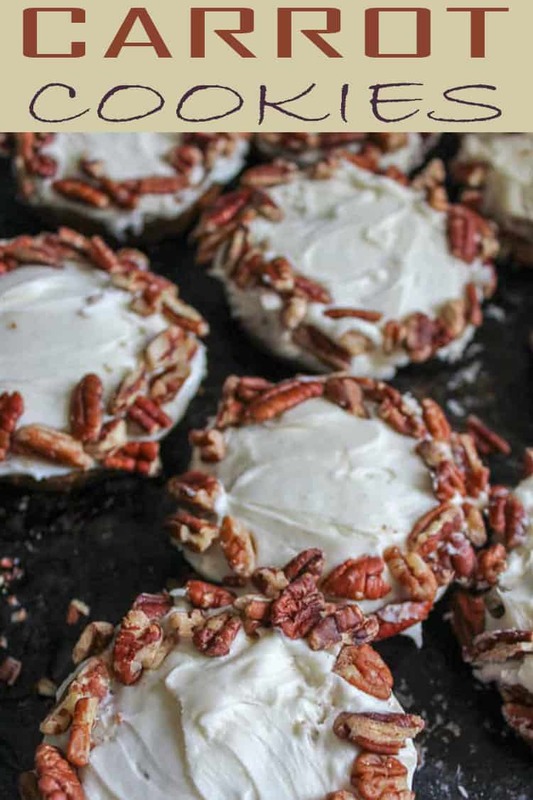 Decorate with chopped pecans around the edges of the cookies.